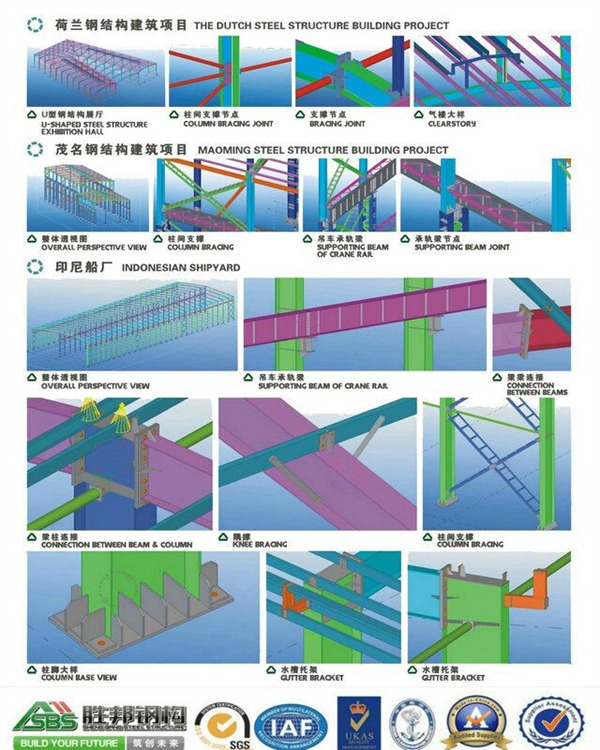 After the general design department designs the steel structure production drawing and the precast steel structure factory building and so on a series of installation drawings, must consider the processing technology, such as tolerance matching, processing allowance, welding control and other factors. On the basis of the original design, we draw the machining drawing (also called construction detail drawing). 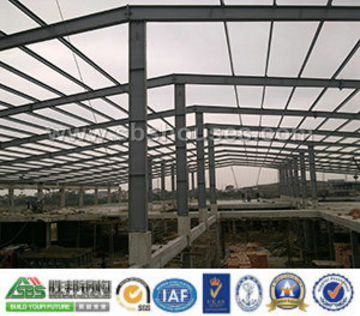 The main contents of the drawing audit include the following project: 1 steel structure design file is complete, the design document includes the design drawing, the construction drawing. Drawing description and Design change notice etc. 2. Steel structural members geometric dimensions are marked complete. .3 the dimensions of relevant components are correct. 4 joints are clear. Do they conform to the steel joints in the national standard. 5 title bar. Whether the number of structural members conforms to the engineering and the total number of .6 members between the form of connection between reasonable processing symbols, welding symbols are complete .8 in consideration of the unit's equipment and technical conditions. Be able to meet the technical requirements on drawings .9 drawing standardization is in accordance with national regulations and so on. Calculate all kinds of materials, specifications and net amount of materials according to the drawing material steel structure building list. Then add a certain amount of wear and tear to put forward the material budget. The project budget can generally increase by 10% according to the actual amount of material. Check the size, size and weight of the incoming material, carefully check the material; If the material is substituted, it must be approved by the design department and modified accordingly. The principle of working out the process is to operate at the fastest speed, with the least amount of labor and the lowest cost. Reliably machining products that meet the design requirements of drawings. Contents include: 1) Technical requirements for finished products 2) specific measures: processing methods, accuracy requirements, inspection methods and inspection tools for key parts; Process flow, process quality standard, process measures (such as assembly sequence, welding method, etc.) of main steel structure components; Processing equipment and process equipment used-preparation of process flow tables (or process cards) basic contents including parts name, part number, material brand number, specification, number of pieces, process name and content, equipment to be used And process equipment name and number, man-hour quota, etc. Key parts must be marked processing dimensions and tolerances, important processes to draw a process diagram. Personnel on duty shall be trained and assessed, and special types of work shall be qualified for confirmation. According to the implementation stage of the project, it can be divided into two levels. The first level is the technical exchange meeting before the start of construction. The participants are: the engineering drawing design unit, the project construction unit, the project supervision unit and the production unit related departments and related personnel. 2) the type and quantity of engineering structural parts; 3) description and requirement of key parts in drawings; 4) introduction to the node of the design drawings; 5) requirements for steel structures and accessories Quality requirements for docking with raw materials; 6) the specification of the technical standard for the acceptance of the project; (7) the time limit for delivery and the description of the method of delivery; 8) requirements for packaging and transportation of components; 9) coating quality requirements; 10) other technical requirements to be specified. made of steel structure has high production efficiency, the workpiece is moved frequently in the space, and the mechanical equipment used in every working procedure must be protected and protected. Safety measures during production are extremely important, especially in the manufacture of large, super-large steel structures. More attention must be paid to the prevention of safety accidents. Operators and production managers entering the construction site should wear good labor protection equipment. Operating in accordance with the requirements of the regulations. Safety learning and safety education for operators, special types of work must be licensed for induction. The stacking and shelving of components should be very stable and should be set up when necessary Support or positioning. Member stacking shall not exceed the second floor. Rigging, slings to be checked regularly. Shall not exceed the rated load. Normally worn wire ropes shall be replaced in accordance with regulations. Strength calculations shall be carried out for the manufacture and installation of all types of placings in the manufacture of all steel structures. The oxygen, acetylene, propane, power supply and so on used in the production process must have safety precautions. The leakage and grounding condition should be detected regularly. The corresponding signs, signals and warnings should be made for the dangerous sources in the construction site. The operator must strictly abide by the safe operation rules of each post. To avoid accidental injury. The lifting of components should be obeyed Personal command. When moving components, no one in the mobile area shall be stranded and passed through. Safe passage for all production sites must be open.